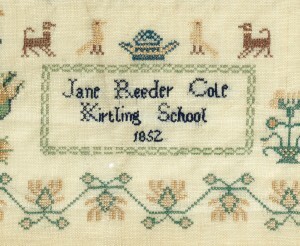 This border sampler was worked at Kirtling School in 1852 by Jane Reeder Cole. It measures 40.7 cm x 31.7 cm (16 x 12½ in) and is worked in silk and cotton threads in cross-stitch and satin-stitch on woollen fabric. 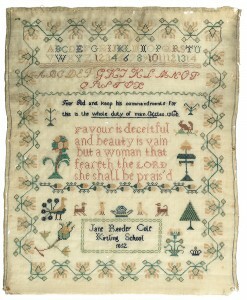 The sampler was given to the Fitzwilliam Museum by Miss Sarah Cole in 1943. The sampler is not on display, but may be viewed by appointment. Please contact the Honorary Keeper of Textiles or the Keeper of Applied Arts, giving the sampler’s accession number, T.7-1943.